Pike of Stickle is typical of the Langdale Pikes - to the south it appears as a massive impressive pyramid of rock, peaking with a small rounded summit, while from the north it merges smoothly into the plateau of Thunacar Knott. From this side only the very top of the Pike is visible, but it still stands out. The Langdale Pikes often blur into the background when seen from further north, but Pike of Stickle nearly always stands out and allows them to be identified. Pike of Stickle isn't the largest or the highest of the Langdale Pikes, but I consider it to be the most impressive, rising in one uninterrupted sweep from the valley bottom to the summit. In contrast Harrison Stickle rises in several steps while Pavey Ark only starts at Stickle Tarn. The summit of Pike of Stickle can only be reached from the general area that sits behind the line of the Langdale Pikes. Our ascent of the Langdale Pikes via Silver How visits Pike of Stickle. Our ascent of the Langdale Pikes from the New Dungeon Ghyll Hotel doesn't visit the summit but can easily be modified to do so. The summit is a small rounded dome, with steep cliffs on most sides. There is a small grassy patch on the very top. The only access is from the north, and that involves a bit of a scramble. 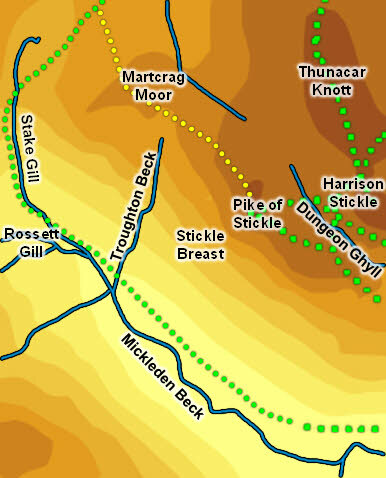 Dungeon Gill rises on the flatter ground north-east of the summit and runs east past the fell. The western boundary is formed by Troughton Beck flowing south and Stake Beck flowing north. Mickleden Beck forms the southern boundary of the fell. Pike of Stickle has no tarns. There was a stone age axe factory in the southern rocks of Pike of Stickle. The area is now rather unstable and best not visited.